Congratulations to Roger Goulden on becoming our new Chairman and to Hazel Goulden our new secretary. Our thanks go to Harry Burrell who has served us for many years in the post of secretary but has now stood down from that role. Also congratulations to Maureen on winning Member of the Year. 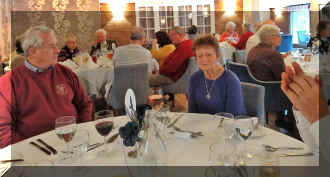 Twenty seven members assembled at The Dower House for Sunday lunch. We had the main dining room to ourselves. The service was swift and efficient, the food was very good. This return visit was as good as the first. Courthouse. You can park in the car park behind - free on Sundays. There will then be a guided walk around Otley. Lunch is organised at The Mill, a short drive from the centre. They would appreciate a guide to your choice of lunch. You can ‘pick and mix’ any of these options, just let Roger know which so he knows who to expect where. Roger Illingworth has organised a Sunday lunch, we have to pre-order. Lunch is £10.50 for one course, £14.50 for two or £16.50 for three. busy time for the gardens and it may be necessary to limit the party size. As the name suggests the gardens are hilly in places. Although the paths are well defined they are steep in places and after rain can be slippery.